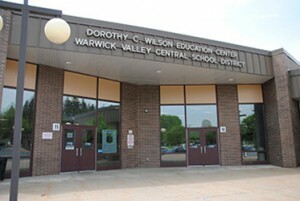 The Warwick Valley Central School District is located in the historic town of Warwick, 55 miles north of New York City in Orange County, New York. The district serves more than 3,500 students in kindergarten through grade 12 in four school buildings, including two elementary schools (grades K-4), a middle school (grades 5-8) and high school (grades 9-12). The district is proud to provide residents with instructional programs that guide our children to success, and benefit all those who call our community home. Our mission is to encourage programs and activities that will foster excellence and raise expectations of students, staff and community. We provide our students with the necessary skills to thrive in the 21st century as learners, workers and citizens. Our core values are embedded in the educational process of our students. Our entire school community believes in enriching every student’s life, educating the whole child as a unique individual, and providing a safe and trusting learning environment as we foster children to be lifelong learners. As part of our commitment to excellence, we recognize and celebrate the positive accomplishments of our students, staff and faculty. We provide a variety of resources and supports to help each student reach his or her maximum potential, including Response to Intervention (RtI), Positive Behavioral Intervention and Supports (PBIS), Honors and Advanced Placement (AP) and Partners in Education (PIE). The district is home to the Little Bear Observatory, a full-scale astronomical observation located at Sanfordville Elementary School. A swimming pool at Warwick Valley High School is open to community members for Morning Lap, 5:45-7:15 am, Evening Lap, 8:30-10 p.m., and Friday Rec Swim, 7-8:30 p.m., beginning in September. Every year, hundreds of students and staff spend countless hours serving the local and larger communities. Through their volunteer efforts, they raise money, support those in need and create lasting bonds through their charitable endeavors. Connecting with others through altruistic endeavors allows students to give back to the community that supports their educational process. Serving those in need allows youngsters to build character and learn empathy – things that are essential to ensuring our future as a compassionate nation. The district helps support community members and organizations by providing use of our campus fields, auditorium, gyms, cafeterias, classrooms and pool. We also provide a.m. and p.m. childcare programs for the 185 day school year – totaling 832 hours of after-school childcare. Warwick has a population of more than 30,000 and is known for its rural charm and character. Dairy farming, which once dominated the landscape, no longer occupies its former position of preeminence. Farming, dairy, produce and orchards are still important, but now a significant portion of residents commute to work in New York City and/or its nearby environs. The Town of Warwick spans 104 square miles and includes three villages (Florida, Greenwood Lake, and Warwick) and five hamlets (Amity, Bellvale, Edenville, New Milford and Pine Island). The black dirt region of Pine Island and Florida produce 25 percent of the nation’s onion crop as well as organic vegetables, sod and flower crops. The region, formed about 12,000 years ago by a glacial lake, was cleared by Polish and German immigrants in the 1880s. Many of their descendants still live and work the farms there today. Warwick’s natural beauty is found not just in its rich farmland, but in its lakes, mountains and scenic country roads, as well. The town borders Vernon, NJ to the south and the “arts & crafts village” of Sugar Loaf to the north. Outdoor life includes hiking, golfing, skiing, boating, fishing, cycling and much more. There are farmers’ markets, wineries, antiques and crafts dotted throughout the town, and Warwick hosts the annual “Applefest” festival each October in celebration of the local apple harvest.